Sometimes, I don’t find it necessary to write a long post describing the dish I’ve cooked. Sometimes, all you need to do is look at the picture and know that this is going to damn good. Today, is one of those days. 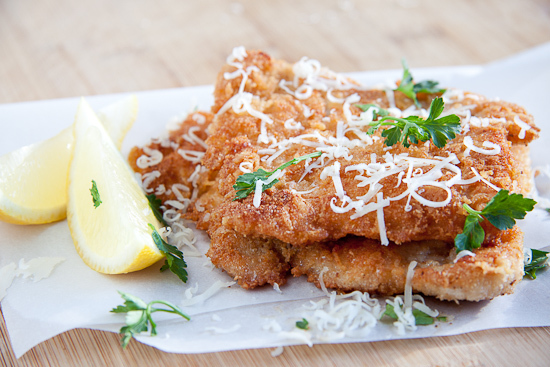 This pecorino (or parmesan if you prefer) crumbed chicken could not be simpler to make or more delicious to eat. Perfectly crisp coating, juicy chicken and the lingering flavour of good cheese is all you need to convince you to make this. 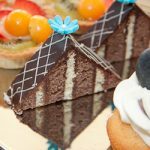 Perfect as a light supper with a fresh salad or as a quick lunch served with some bread and home-made mayo. Simple and delicious! Place a large frying pan over a medium heat. Place the chicken breasts between two sheets of cling-wrap and thin out with a rolling pin or mallet. Combine the breadcrumbs with the cheese, salt and paprika. Place this in a shallow, wide bowl. Place the beaten eggs in a similar bowl (big enough to dunk the chicken into). To coat the chicken, dunk it first into the egg mixture and then place into the crumbs, coating the chicken well and patting down the crumbs. Place the chicken in the frying pan and allow to fry for 2 minutes per side until the crumbs are crispy and the chicken is cooked through but still moist. Serve hot with fresh lemon. I love this recipe!! Definitely doing it tonight! Just a quick question, should I use oil in the frying pan (if yes, how much? Yes, use about 1/3 of a cup of oil to fry the chicken in. I made this tonight for dinner with Parmesan. My hubby and I both loved it! Thanks for sharing a great recipe. Naoko, only a pleasure. Glad you liked it. my wife made this and were just a little confused on how you can cook a large chicken breast in only 4 min or so? it took us almost 15 min. did you forget a step with the chicken or does food just cook faster on your stove? Hi James. It’s very important that you beat the chicken down until it’s quite thin. Not more than 1-1.5cm thick. This way, even if they are very large breasts, they will cook within a few minutes per side. If the chicken breasts you have are very thick, butterfly them by slicing into them (but not all the way through). Pound the butterflied chicken to 1cm thick and proceed. Sounds delicious, love the flavor of pecorino cheese! I made this last night and we absolutely loved it! Thanks! OMG!!! Hubby and I made this tonight with a breast/ thigh combo … we used panko crumbs in place of the regular bread crumbs (what we had in the cupboard) and it was sooooooooooo delicious!!! The only thing I was not to sure about was oil for cooking you did not specify in the recipe if you used any or not … I did, a couple of tbsps. 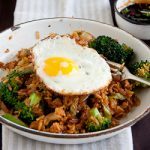 Family loved it and this one will be put into the regular dinner rotation! 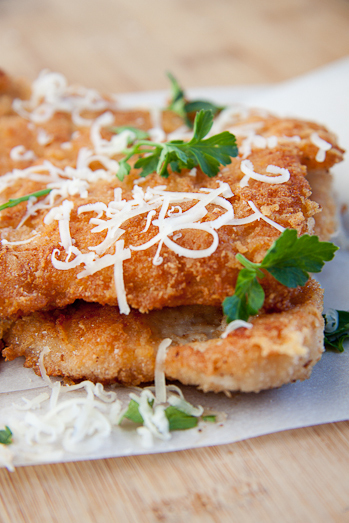 My favourite, crumbed chicken, definately trying this one out!!! Made it your way since my non-fried food eating daughter is recovering from having her wisdom teeth out yesterday. It was a real hit- delicious flavor- I also used boneless skinless thighs. Great dish! Deb: I’m so pleased you liked it. I had good intentions of making oven fried chicken tonight, but I think this picture has blown that out of the water. I wonder if this would work as an oven fried recipe? I’m sure it could work as a oven-fry option as well. Try it and let me know how it turns out?